Today I show how to use the rock n' roll technique with the script from my Stately Flowers 9 set along with some simple sponging to create a beautiful vintage patina on your mats. I also show how to color the peony from the same stamp set with Spectrum Noir markers. Please enjoy! See more of my Stately Flowers sets here. They all play nicely together and would look fabulous with these techniques! Thanks you for watching and visiting today! I hope you had a fabulous weekend and this week is off to a great start! Good morning, everyone! 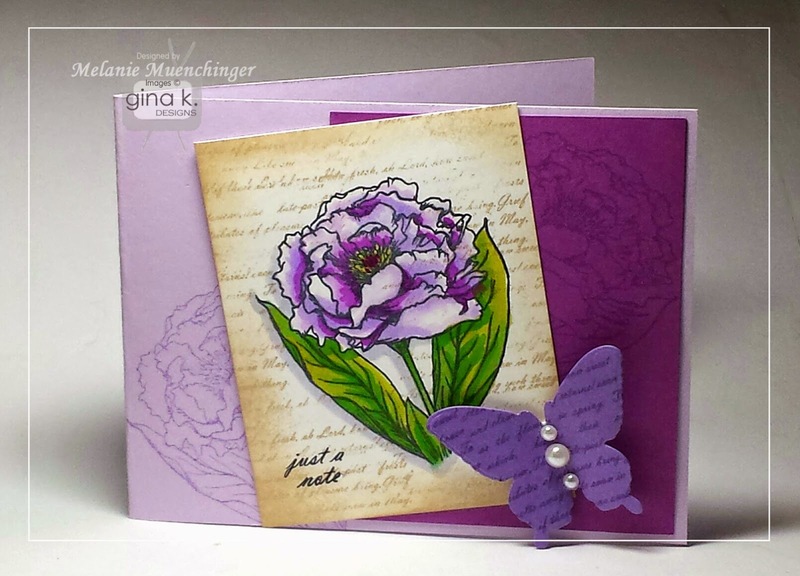 Welcome back to another Inspiration Hop with the Gina K. Designs team. As you hop through each member's blog, make sure to leave a comment on each of them because we will choose a few random comments and those stampers will each win a grab bag of Gina K. Designs products! To see the full list of winners, check the Big News Forum at StampTV in a few days. The first set we are showcasing is Theresa Momber's Northwoods 2. I doubt this is what Theresa had in mind when she put these two bears in Northwoods 2, but after looking at the stamps for a minute and drawing from my own experiences it seem natural for this mother and child to go climbing. It makes me a little verklempt to remember two things as I made this for my son: the sweet picture books about baby animals I used to read him, and the times he loved just being out in nature with me, whether it was on a simple outing or our own yard. It brings me a lot of happiness and gratitude, but is also bittersweet how much things have changed as they grow up. (I handle it better some days than others, you know? Sniff!) Anyway, it came out exactly as I imagined. Just simple sponging in Gina K. Ocean Mist ink for the sky to really focus on the moment. 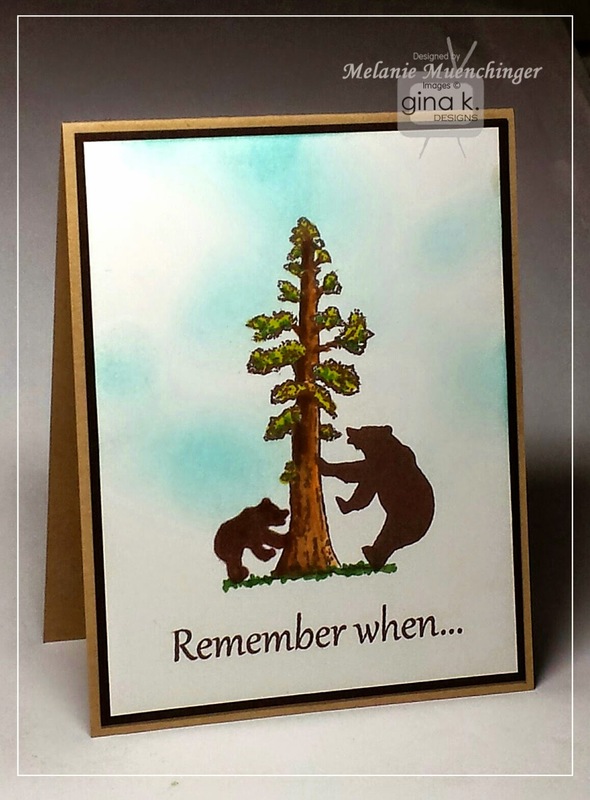 I reverse stamped the baby bear using an acrylic block and then filled in any blotchy areas with Spectrum Noir EB3, and then colored the tree with EC3, EB6, TN3, CG3, and CG4. Images and greeting stamped in Gina K. Dark Chocolate. Cardstock is Gina K. Pure Luxury White, Dark Chocolate, and Sandy Beach. 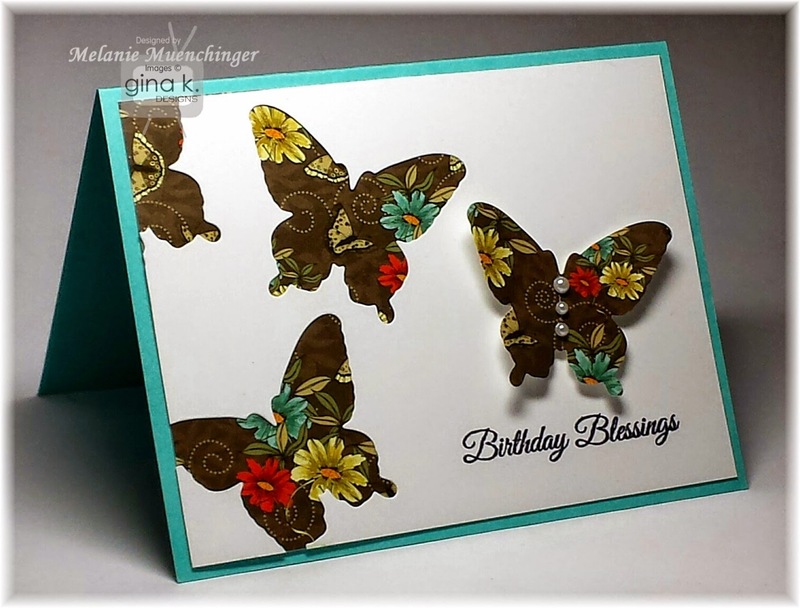 Next up we have the Birthday Essentials StampTV Kit. Lovin' the dies! I used them on both cards today in different ways and they make clean and simple cards so easy and quick. I cut several butterflies with the die from StampTV Kit out of a 4" x 5 1/4" piece of white cardstock, and then layered a piece of GKD Shabby Spring patterned paper the same size under it. (Save those white butterflies you cut out for another project!) I cut one final one from the same patterned paper to add dimension, bent it, and accented with adhesive pearls. I stamped the heart branch twice in the GKD Fresh Asparagus, and then the larger leafy images in the corners in GKD Grass Green. 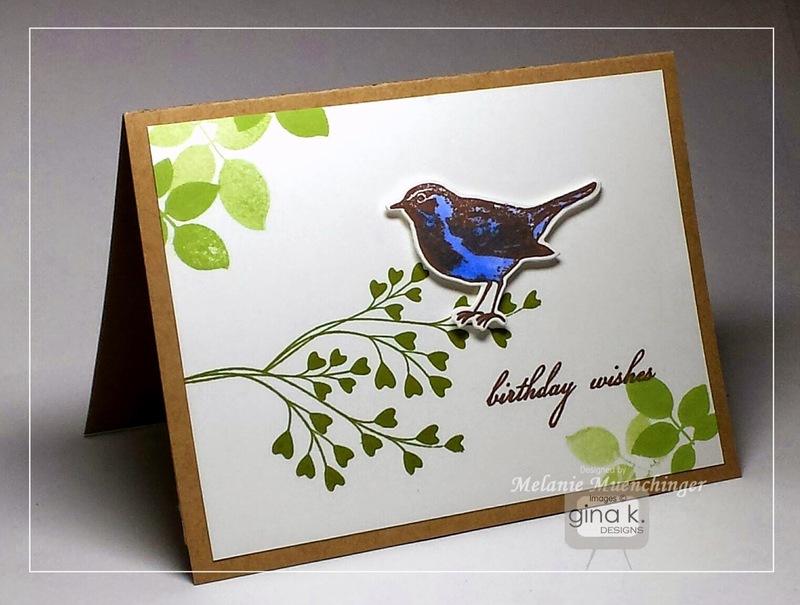 Bird is stamped in GKD Dark Chocolate, cut with the coordinating die and colored Spectrum Noir TB3. Color in a kraft-y ink for a more matchy-match, subtle look or pick a bright color like this blue to really pop! Cardbase is GKD Kraft.